This beautiful pink crystal saddle is every cowgirls dream! Featuring hand stitched pink beads, crystal accents, and a pink suede seat to give this set a pop of color. Free matching tack set for only $399.99 today! This saddle may have minor cosmetic imperfections in the rough out. Price has been reduced. These imperfections do not effect the functionality, durability, or appeal of the saddle. 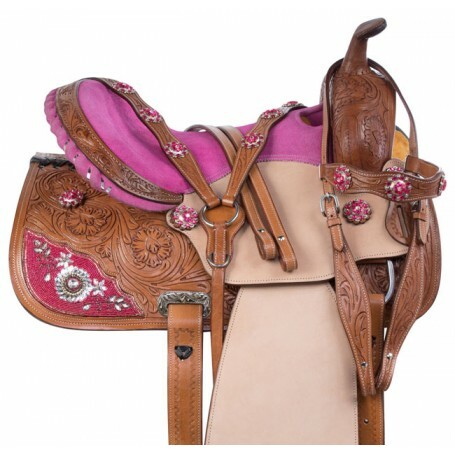 This amazing one of a kind pink saddle is every Cowgirl's dream! This two-tone saddle features an intricate hand stitched beading & crystal design that accents the skirt. The rough out jockey flaps and fenders help to give the rider grip while racing around the barrels. The hand carved floral tooling help to give this saddle dimension, while the Pink crystal conchos give the saddle a pop of bling! The Pink suede seat is nicely padded for the rider's comfort and the bottom underside features a thickly padded synthetic fleece to ensure your horse stays comfortable. 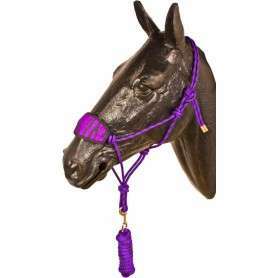 Receive a free matching headstall, reins, and breast collar while supplies last! 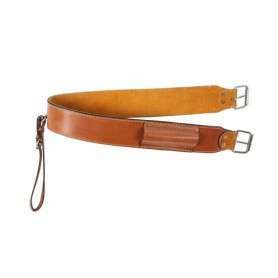 Cinches are not included.